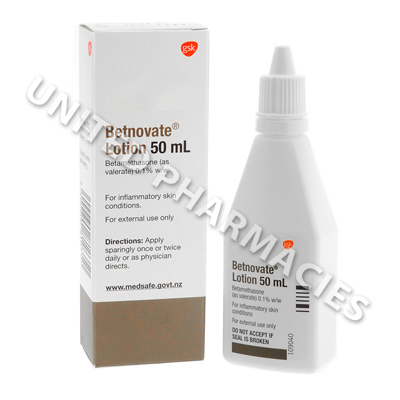 Betnovate Lotion (Betamethasone Valerate) is a topical treatment for inflammatory skin conditions, including various forms of eczema, allergic contact dermatitis, seborrhoeic dermatitis, psoriasis, prurigo nodularis, insect bites, and other similar conditions. Betnovate Lotion (Betamethasone Valerate) is a topical treatment for inflammatory skin conditions, including various forms of eczema, allergic contact dermatitis, seborrhoeic dermatitis, psoriasis, prurigo nodularis, insect bites, and other similar conditions. The active ingredient in this lotion is a type of corticosteroid medication. Direct application of the lotion to the affected skin can help to relieve redness, itching and inflammation. Generally, these symptoms occur as a result of the immune system releasing certain substances which causes widened blood vessels. Preventing this immune system reaction leads to relief from the symptoms of inflammatory conditions. The frequency of application for patients using Betnovate Lotion (Betamethasone Valerate) may be different depending on the condition that is being treated. Your doctor will tell you how long treatment is required for, as well as the frequency of application. Adults are usually instructed by their doctor to apply it 1 to 2 times per day. When the skin starts to heal, the doctor may reduce the application frequency. Patients who do not notice an improvement in their skin after 2 to 4 weeks of treatment will need to see their doctor. Your doctor should be told about any side effects that occur. If you experience fatigue, weight gain, blurred vision or any other serious symptoms, see your doctor immediately. Other medicated skin products should not be applied to the skin unless your doctor has told you that it is safe to do so. This lotion should never be applied to broken or damaged skin. Always use Betnovate Lotion (Betamethasone Valerate) as you have been prescribed by your doctor. Never self-medicate or change your dosage without first consulting your doctor. The correct dosage can vary depending on your health, medical history, and the severity of the condition being treated.